For a while now, Amazon.com has had the few Wii U games they have listed as showing with MSRPs/list prices of $49.99; that changed yesterday. 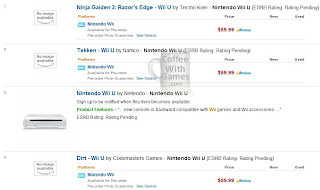 Amazon.com had the Wii U titles Ninja Gaiden 3: Razor's Edge, Tekken, and Dirt all listed with $49.99 MSRPs. Amazon.com updated their listing prices on those Wii U games yesterday though, and they now appear with a MSRP of $59.99. Welcome to the HD gaming generation? While some Wii owners may not be happy about the $10 increase from the Wii's MSRP for most games, at least it's not a return to the Nintendo 64's days (yet), when I paid $70 for some N64 games. While I'm cheap with my money, as long as games use the Wii U's controller and/or online services in unique ways, I will be okay with the price increase. 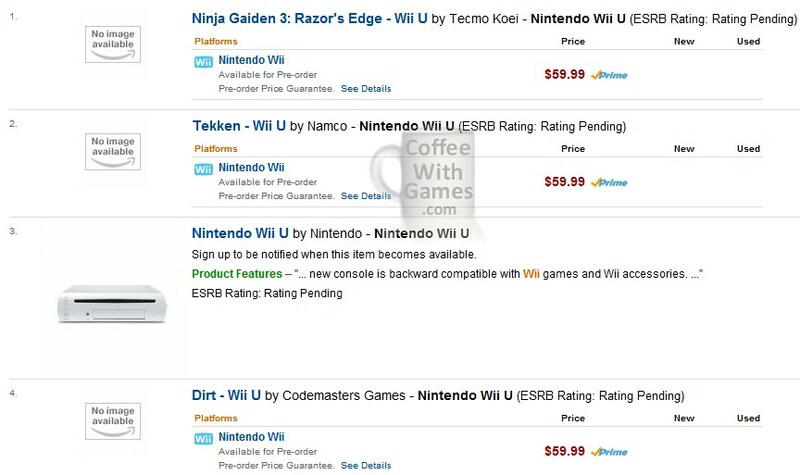 Do you think Amazon.com raising the prices of these listed Wii U games confirms that most of the console's games will list at $59.99? Doesn't bug me in the slightest. The more we pay for games, the more profitable the developers are, the better off we are in the end because the developers can then take creative risks. Higher prices are a virtuous circle. I think it's a bummer, but to be expected. I am just hoping the next round of PS/Xbox games doesn't push up another $10. This sort of gets back to my blog topic about how it feels like the game industry is pricing itself outside of what kids can afford anymore. "The more we pay for games, the more profitable the developers are..."
Depends on a lot. We were told the cost went up on the 360 and PS3 because of development cost, so if that's the REAL reason...then the developers would still be about breaking even. But, when was the last time somebody trying to sell you something told you they were making 1,500% profit on the product though (besides Apple), and that you should buy it because it's a great deal? The entire market is very, very, VERY interesting right now. If it's not a full MSRP retail game, it's a "free" game, or "low cost" Digitally Downloaded (see that!) title that has about 50,000 objects you can purchase to make the game "better". Well, breaking even isnt really enough for a sustainable, much less healthy business model. A 150-200 per cent profit on the overall cost of a product is fair. I don't really care if that means its a 'good deal' or not, as I tend to care more about the people that supply me with the products and services I love, than the folks that are destroying the industry by demanding that everything provide more content, for less price. Oh I know, I was just saying how the price increases are usually passed off with the, "It's development costs.". "...than the folks that are destroying the industry by demanding that everything provide more content, for less price." I don't see how a consumer, can destroy the industry...if the industry is meeting a consumer's needs, the industry should profit and consumers will gladly pay. Now if the industry produces a product, and a consumer purchases that product and has legitimate complaints, that's 100% okay and the way it goes. The consumer may/may not recommend the game based on their experience with it. Usually, from what I have seen, companies are destroyed by internal business decisions (or lack thereof). Rarely is it "the folks" demanding more for less. Now, if you want to join the race to the bottom for prices though, there are many options out there, and developers trying all new ways to deliver games in just the HOPES of probably breaking even.